Looking for great apps at a fraction of their regular cost? We’ve found 35 iPhone and iPad apps that are currently on sale. 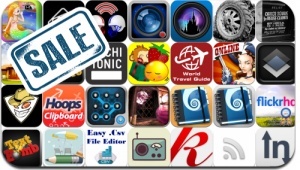 This app deal alert includes Spellsquares: Cursed Moon, Bang!, Lock Security, MobileRadio, Disney Photo A Day, Knowtes, Over, HDR Fusion, Burst Mode, iRSS.Pro, Starmap Pro, Swackett X, and many others.